Bobbie T Arts, Inc is so excited to invite you to a day of sheer creativity with the one, the only...Robin Dudley Howes! 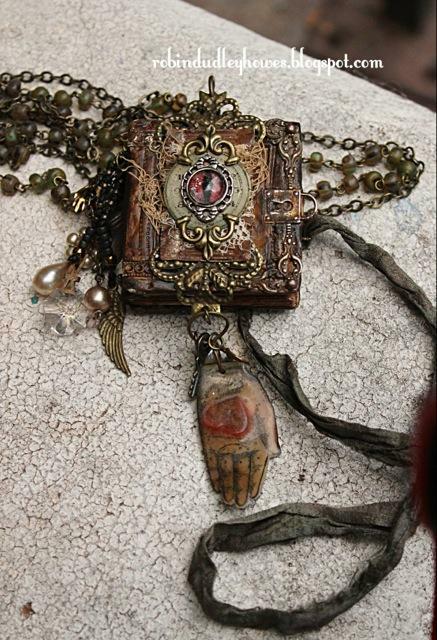 It is such an honor to host Robin's one day workshop..."HOCUS POCUS Mini Book Necklace" on July 29, 2017. The fee of $145 includes the class fee and a full kit. Refreshments and light lunch, compliments of Bobbie T.
Workshop hours are 10-5pm. Doors open at 9:00 am. Location of the workshop is the San Marcos Mobile Home Estates' Clubhouse. The Clubhouse is a spacious, well lighted venue for this event...very comfortable and welcoming. Hope you'll join us for this very special workshop with Robin, and me, Bobbie T.
I had such fun making these little books and you will too! In this class we�ll take the foundations of book making into miniature territory by scaling down and thinking �small�, making a book you can hold in the palm of your hand. 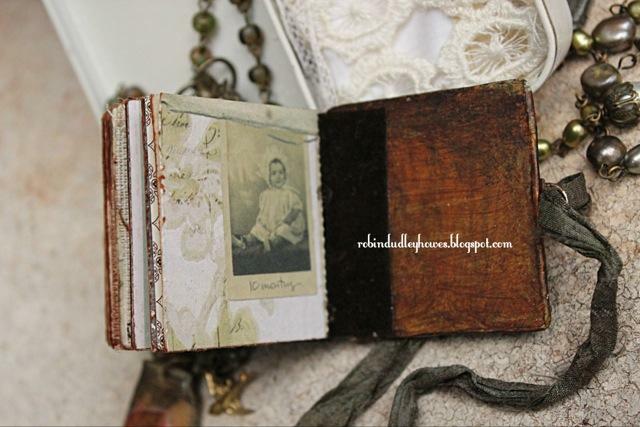 I will show you how to make the whole book from scratch using my hand made molds or stamps, apoxie clay, and embossing tools as well as hand stitched signature pages. You�ll also learn how to give your book an antique leather look, how to use eyelets, finish with layers of embellishment and as a bonus I�ll show you how to make the hand charm! If you choose to make your little masterpiece into a necklace bring something to hang it on like beaded chain or ribbon. You will love these little books! The book is only 2x2 inches with � inch spine. For your convenience, everything you need to make your mini book necklace is included in your class fee, well thought out, prepped and ready to assemble assuring a finished project. Most items you see in the sample will be provided in the kit or very similar. Feel free to bring any extra charms to personalize your piece. I will bring several adhesives, needles, paint, brushes, gloves, tools, hole punch, pliers.